Special thanks to Laura and Lucky for sending me their story. 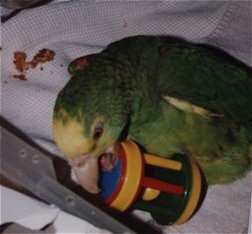 I have an Amazon, Lucky, that I got when she was five weeks old. Lucky's breeder pulls the babies at four weeks to sell to a pet store which hand feeds and weans. Her habit is to hand feed for a couple of days, before delivering them. When she went to pull Lucky's clutch she found three babies, two of which were dragging ragged left legs, using their right hocks to propel their bodies. 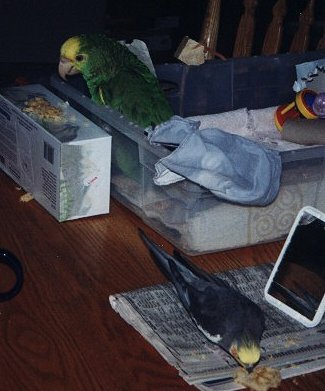 Unfortunately the breeder was dishonest to her friend that was the middleman for me to take Lucky. Most of what I know is from the vet tech that assisted the vet that did the amputation she has the other baby. The breeder said the parents mauling the babies could have been from construction work in her neighborhood (there were streets being built and dynamite was used). She didn't check on the nest because there is no checking, she'd have to pull the babies then, and she doesn't do that till four weeks! The two babies left legs were broken in several places and the vet saw no hope for saving their legs. It's thought that maybe as early as the first week in the nest the birds were mauled by their parents. All injuries were old and healed and the left legs had little skin on them. The vet tech took one of the babies, I got Lucky and the breeder sold the third unhurt baby to the pet store. I paid for the vet costs, picked Lucky up and took her to my vet right from the breeder. That's where it was discovered her other leg had also been fractured. The first vet had somehow missed it. The other bird's right leg is also crippled. Probably like Lucky's, also fractured and healed bent/crooked with all toes forward and clubbed. She didn't have further surgery. 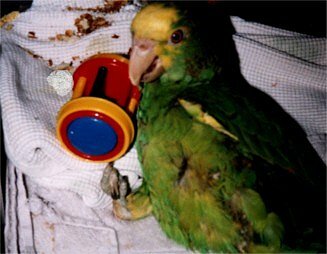 My vet encouraged me to return her and make the breeder deal with her but I had a feeling the breeder would opt for euthanasia. Plus I was already emotionally involved with Lucky. It had been ten days since I was first approached about taking her. 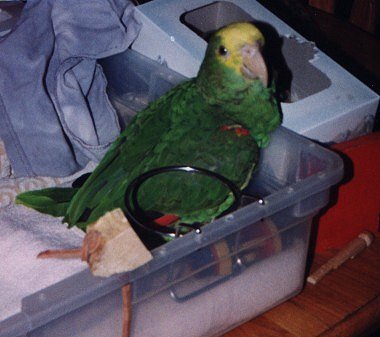 I had been planning how to set up her cage, ordering special perches, etc. I wanted her and thought if any Vet could help her mine could. She had her left leg amputated. My vet performed surgery but the soft tissue damage was too great. She can stand on her hock that twists to the side, all toes forward. She is the most amazing bird. Not just because she is a crippled one leg bird but because she continues to exhibit a zest for life every day. She makes me smile all day long with her words, hums, songs and exercises. I know what you mean about people feeling sorry, I get that a lot, even my husband and son thought it wrong at first to have her. It was a long time of healing from her surgery to straighten her leg. Her bone had to be re-broke, scraped, realigned and set with pins. Months of casts and she thrived even with this huge box like cast and pins in her bone. Lucky makes all smile now and of all my birds she's the most easy going. She likes to be able to get close to us. On the table in her box she'll lean and coo so we pay attention to her. 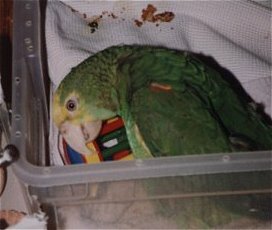 In her cage she has a cushioned floor, rope perches and climbs and sits in a padded food bowl. 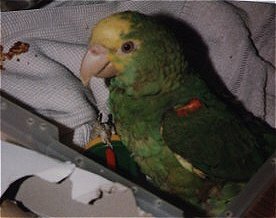 She loves to go up and does exercises like chin-ups with her beak and her foot curled around a cage rung. She plays with toys, dragging them to exactly where she wants them. Her days are so filled with her activities she sleeps 12 full hours every night, then wakes up and starts all over again. Lucky was named by my husband, a concession I made so he'd feel better about me having her. I was not thrilled with the name; I wanted something more special. As it turns out I love her name- because I'm the lucky one!